Flag by Juan Manuel Gabino Villascán, July 2005. The final decision shall be made in Singapore on 6 July 2005. The other candidates are New York, London, Madrid and Moscow. Ivan Sache, April 9, 2005. Voting will take place in successive rounds until one candidate receives a majority of those voting. The ballot continues until one candidate gets an absolute majority of the votes cast. IOC members ukom a country whose city is a candidate in the election must abstain from taking part in the vote. Non-votes, spoiled votes, and abstentions do not count toward the calculation of the majority. For example, if 100 members are present, but four (4) abstain, the number of votes needed to win is 49. If no candidate city achieves a majority in the first round, the candidate with the fewest votes drops out of the running, and the members vote again on the remaining candidates. If two or more cities are tied for the lowest number of votes, a runoff election will be held between them, with the winner going on to the next round. As part of the reforms undertaken by the IOC at the end of 1999, IOC Sessions are open to the media via closed circuit telecast. This has been the case since the 109th Session in Seoul in 1999. The closed circuit feed of the election will be available for broadcast. The members will vote by electronic device, which immediately and securely tallies the votes. The electronic voting devices were first introduced during the 111th Session in Sydney in 2000 as part of the organisation's drive to update its policies and procedures. The voting system is certified by an independent company. How each member votes is not recorded to shield the member from external pressures to vote in a certain way. If multiple rounds are needed, the IOC will immediately announce which cities will go on to the next round. The tally of votes per round will be reported after the conclusion of the election. Quoted by Juan Manuel Gabino Villascán, 6 July 2005. Reported by: Esteban Rivera, April 23, 2005. I can't check the version without an extra slogan, but all the flags I have seen have been 1:2. The two flying near here at the moment both have the "Back the bid" slogan, as in the picture I mentioned in February, which is still sitting around at this photo. I have vague memories of seeing somewhere just the logo on a bedsheet, with the logo taking up roughly the same amount of the flag as the logo+slogan does in this case. Jonathan Dixon, July 7, 2005. The shape of the stripes in the Olympic colours which weave through the lettering represents the course of the River Thames through London. AFP (and probably several other press agencies) reported on 13 May 2005 that Alberto Ruiz-Gallardon, Mayor of Madrid had announced that the "largest flag ever in the world" would be displayed on Sunday 5 June in Madrid, as a support of the bid of the Spanish capital city for the organization of the Summer Olympic Games in 2012. The flag Madrid-2012 shall be 2.5 km long and will be displayed on the Paseo de la Castellana, one of the main streets of Madrid. 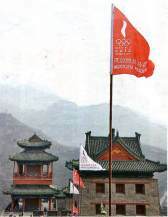 The red and white flags show, in white and red respectively, the Madrid 2012 logo with only the English caption (CANDIDATE CITY) and beneath it the official slogan "MADRID 2012 READY FOR YOU" in Chinese and English. "Madrid 2012's trademark is made up of 2 graphical elements: the symbol and "Madrid 2012"'s full emblem. "The symbol is the graphic shape which serves as the project or body’s emblem and is designed to be both representative and recognizable. Graphically, it appears as a solid and irregular shaped mark, vertically positioned. Evoking the Olympic flame or the energy of a rippling flag, its significance can also be extended to the feelings of elation and passion generated by important events within a community. "Madrid 2012's new corporate image includes the five Olympic arcs, as assigned to candidate cities. The Olympic symbol represents the union of the five continents and that the Games provide the meeting point for the world's athletes. Candidate cities should always include the caption alongside the Olympic Arcs." There's an image (Source: http://www.mylifescoop.net/knowledge-base/10-hottest-soccer-girls/) which shows a stronger or rather darker red than the flag already reported, which in my concept, is more crimsom-like than red. Now, the variant on the flag found, is that it also reads candidate city (in English) and not only the Spanish language text. The pretty lady on that picture holds a slightly different flag. Its ratio seems to be 1:2, the logo itself is smaller, and as you mentioned it was bilingual, both Spanish and English text were placed on it. Take care that there was more than one version of the emblem. It may be that the flag version was different from the print. version, or something like that, but whatever the pattern, thought the logo itself was always at the top, and the status at the bottom, the Olympic rings, and the city and the year would not always be in the same order. AFP (and probably several other press agencies) reported on 13 May 2005 that Alberto Ruiz-Gallardon, Mayor of Madrid had announced that the "largest flag ever in the world" would be displayed on Sunday 5 June in Madrid, as a support of the bid of the Spanish capital city for the organization of the Summer Olympic Games in 2012. The flag Madrid-2012 shall be 2.5 km long and will be displayed on the Paseo Castellano, one of the main streets of Madrid. Sport and leisure activities will be organized the same day between Plaza de Cibeles and stadium Santiago-Bernabeu. The day will end with a concert by the Colombian singer Shakira and fireworks. 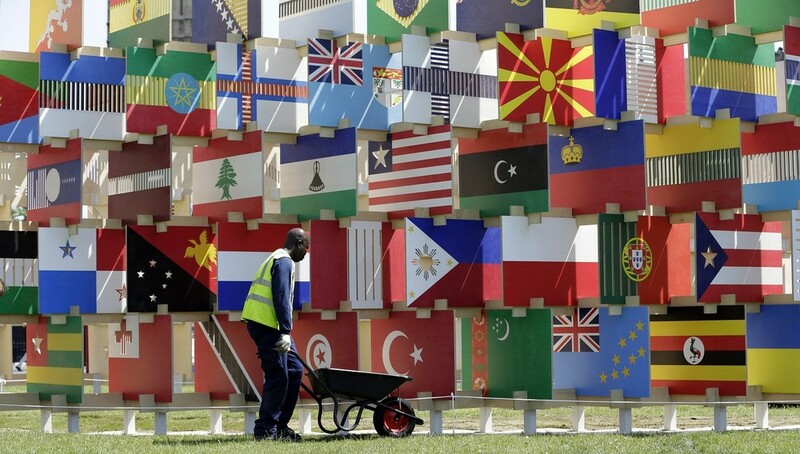 I suppose a 2.5 km long flag cannot fly; anyway, Madrid has not the least chance against Paris, because Paris has the ugliest flag ever displayed for an Olympic bid. I am eagerly waiting for the 6 July and the decision, so that all these horrible Paris-supporting artefacts eventually disappear. Which brings us to the issue of ratio: since the Paseo de la Castellana, while a wide boulevard, is nowhere near 1 2/3 km wide, this flag will have to drape over a considerable number of buildings. Even aside from questions of hoistability, it's hard to accept a piece of cloth in proportions of 2500 m long but only perhaps 100 m wide, if that, as a "flag." Some newspapers, such as El Mundo, mention the Guinness Book of Records, possibly quoting a City Council source, possibly only elaborating on their own. Anyway I wonder whether Guinness would accept as "flag" any large piece of material unable to be flown or hoisted. Flag by Juan Manuel Gabino Villascán. July 2005. The French national Olympic Committee is called Comité National Olympique et Sportif Francais. His current president is Henri Serrandour. Following the tradition, the French medalists in the Athens Olympic Games were invited on 28 September 2004 at the palais de l'Élysée, the seat of the French presidency, by President of the Republic Jacques Chirac. The flag of the CNOSF can be seen on the group photo taken during the ceremony. The flag is white with the Olympic rings surmounted by FRANCE in blue letters. There is a red horizontal line between FRANCE and the rings. The "S" of Paris and the first "2" of "2012" form a heart. The colours of the letters recall the colours of the Olympic rings, but not in the same order. VILLE CANDIDATE is written in black below the logotype. The Olympic rings are placed below the writing. There are four official base colours, and another version for the logo. There have been two London 2012 logos: one for the bidding process created by Kino Design and a second as the brand for the Games themselves. The former is a ribbon with blue, yellow, black, green, and red stripes winding through the text "LONDON 2012," making the shape of the River Thames in East London. The latter, designed by Wolff Olins, was unveiled on 4 June 2007 and cost £400,000. This new logo is a representation of the number 2012, with the Olympic Rings embedded within the zero. This will be the first time that the same essential logo is to be used for both the Olympic and Paralympic games. The standard colours are green, magenta, orange and blue; however the logo has incorporated a variety of colours, including the Union Flag to promote the handover ceremony. Wow, a flag on a logo on a flag. Has anyone done a drawing for that: I would like to try out how it looks when flat. I do have the suspicion, though, that it's not really possible to cut-up a Union Flag of any ratio to fit the pieces shown. Hm, I can't recall seeing all four of them. How do you mean another version of the logo? As in the version with the shape a second time, lightly shifted, behind it in white? Or really different? One of the reactions I didn't get on that last message was the one from the organisation themselves. Or rather, they did reply, but had no idea what version I meant, even though I described it, and though I pointed them to where is was on the website at the time I wrote the message (though it no longer was there when more than a month later, they reacted). Since my question about special meaning got me in reaction a link to the Our brand pages, which doesn't seem to give anything on the specific versions, I have to assume all versions are equally possible and meaningless. I think it's important to notice that there's not only one flag, but many to be displayed during these games, and hopefully we can have them all explained and drawn to be feature on FOTW-ws. When reading about the creation of the logo, it's shape is a mixture of the trail that the Thames River follows in London as well as the numbers 2, 0, 1 and 2. What I meant was that there's an official logo for the Summer Olympics (a clear version which is a black outline and also other four official colours ( blue, orange, green and purple ) and there's also another official logo for the Summer Paralympic Games, all of them featured here. Thus, there are two official logos (the Summer Olympics and the Summer Paralympic Games). Actually, this was about the handover flag, which has a Union Flag pattern on the Games Logo. I'm expressing my doubt whether the Union Flag pattern could be made by cutting up a real Union Flag design to fit the pieces of the logo. The basic difference is that each will have the related emblem on the 0. Then there are some additional graphics on the Paralympics logo, of which I can only understand the bits on the second 2. Some research is needed, apparently. Also, most Paralympics logo depictions are in the exact same colouring, though there are exceptions, e.g. on these stamps: http://www.london2012olympicsmedaltally.com/stamps-for-the-london-2012-olympics/ . (I wonder about this website's status, as they do use an official logo, which creates a suggestion of being connected to the organisation, but the logo is the bid logo, which would suggest they're not allowed to use the games logo. Also, take a look at the illustration on their home page. Team Malawi marched with the 1964-2010 flag. So, I could be said tha the old flag has been officially adopted. I just watched the opening and noticed the same thing. However, I am still wondering if this is official, or if it is the second flag error at the games (after flying the South Korean flag at a North Korean soccer match). But since the Malawi team marched smiling under this flag, I think we have to assume its official.